SOMEWHERE out there, one of Greg Baartz's customers is a millionaire - they just don't know it yet. The owner of the Lucky Charm news-agency sold a winning ticket for Saturday's Gold Lotto jackpot but the holder has yet to claim their $1.3million prize. Mr Baartz has urged customers to check their tickets and hopes the winner will be found soon. "It's fantastic to help turn someone into a millionaire, wherever they are on the Fraser Coast," Mr Baartz said. "But unless they come forward and claim the ticket, we won't know who it is." The Hervey Bay ticket was one of 15 division one winning entries across Australia in Saturday's Gold Lotto $20 million draw 3827. Each entry fetched the division one prize of $1,333,333.34. As Hervey Bay's winning entry is not registered to a Winners Circle, Golden Casket officials and the newsagent have no way of contacting the winner. It's the second major win in just a few weeks for Mr Baartz who previously sold a $1 Instant Scratch-Its ticket worth $10,000 last month. "It's been very exciting for us, especially coming off that event in February," Mr Baartz said. "We'll be glad when the winner can come forward so we can know who it is and see the expression on their face. "It means a lot for our store, as it will bring in customers and bring up sales." Golden Casket spokesperson Matt Hart said he was eager to confirm the division one news with Hervey Bay's newest millionaire. He urged all Gold Lotto players to check their tickets. "While we don't know the identity of the winning ticketholder, I'm sure they'd love to discover they are now a division one winner," he said. "You may not think it's possible that you could be the division one winner we're looking for, but if you purchased an entry in the weekend's Saturday Gold Lotto draw that you haven't checked yet, you're in with a chance." The six winning numbers in Saturday Gold Lotto draw 3827 on Saturday March 24 were 30, 19, 10, 39, 33 and 23, while the supplementary numbers were 17 and 34. Saturday's Gold Lotto is the latest in a series of lucky wins across the region over the past few months. Maryborough mechanic Jonathon Selby was $30,000 richer after answering a call from Channel 7's Cash Cow competition. In September 2017, a Hervey Bay man won $1.6 million from part of the $30 million Gold Casket lotto. 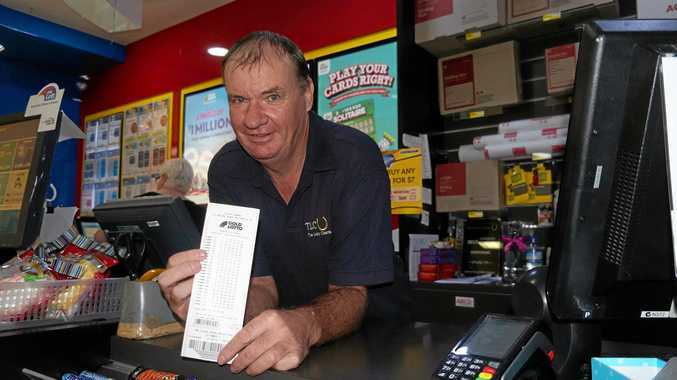 In June that same year, a retiree holidaying on the Fraser Coast from Tamworth won $100,000 after purchasing two $2 lottery tickets.